CNN correspondent Fred Pleitgen (@fpleitgencnn) continues to report from Damascus on heightened tensions surrounding alleged Israeli airstrikes and reports on the possible use of chemical weapons in Syria. 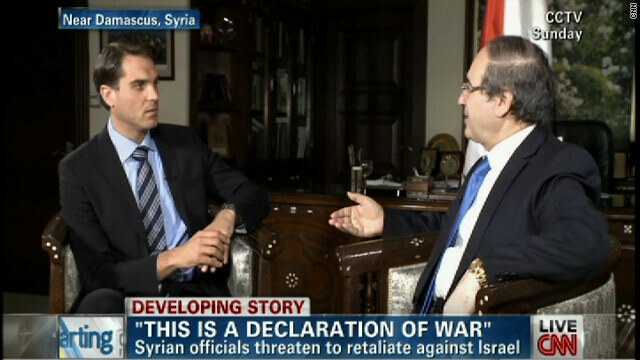 In an exclusive interview with CNN Sunday, Syrian Deputy Foreign Minister Faisal al-Mekdad said the attacks on the nation’s military research facility amount to a “declaration of war” by Israel. Watch that interview here. Last week, Syrian Information Minister Omran al-Zoubi told CNN exclusively that his government had not, and “would never use” chemical munitions — “if we had them.” Watch that interview here.